James Wanless, creator of the Voyager Tarot, is a world traveler. His home base is Marina Del Rey, CA, but he seems to rarely be there with appearances across the North America, Europe and Asia. Nevertheless, he does appear in Santa Barbara about once or twice a year for a presentation and a couple of days of readings. I make it a point to be there! 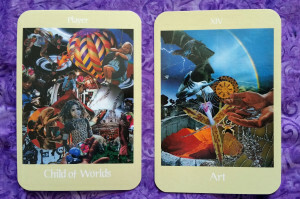 The Voyager Tarot was one of my first decks in the 1980s. The cards feature a startling collage array of themed pictorial images based on the meaning of the card along with a keyword appearing on the boarder of each minor. James Wanless fills the room with a warm, powerful energy with sparks of humor every few sentences. He is a great speaker and makes it a pleasure to be a student. In the space of an hour we covered bits of the last fifty years of his life along with exercises in self-discovery. What would you like to let go of? How might you fill your life with something better? We drew cards for ourselves for answers to these question and discussed the messages obtained with each other. This is personal empowerment at its best! What a wonderful way to spend the evening! I’ve featured the cards I drew in response to these questions. I set my intention to let go of my preoccupation with the accumulating things to offset my financial worries about the future. I drew the Child of Worlds with the keyword Player. This would correspond to the Page of Pentacles in the Waite-Smith deck. I saw a child-like preoccupation with collecting objects and things of value like a magpie. The child in the central picture looks intense and unhappy. The images involve action and competition. My solution card for filling my life with something better was Art, major arcana 14 corresponding to Temperance in the Waite-Smith deck. I love the image of this card with outstretched hands holding droplets of water with a rainbow in the blue background. There is lots of nature present including three butterflies – a very personal and heavenly message to me. I took this to mean that my solution for replacing what I want to let go of is to fill my life with an artistic focus and balance. I was an English Literature major and writing has always been a love of mine although my nearly 40-year professional career has not involved much artistic creativity. So, I’ve got the solution for more fulfillment! I have a great fondness for the Tarot de Marseille (type II versions). I’ll write more about this later. I like these original iterations of the tarot as pure, simple expressions of all of the information available. There is no embellishment or dilution of the concepts caused by filtering them through complex art or esoteric structures. The simple, clean images allow the mind freedom to wander and search for inspiration within the spread. Most modern card images constrain us to the specific scene portrayed by the artist and his or her artistic translation of the meaning of the card. This can evoke a visceral response to the art that may have little to do with the nuanced meaning of the card. The Voyager Tarot presents the reader with a complex mélange of images related to the root meaning of the card rather than an illustrated artistic scene. It is at the opposite extreme from the simple, but precise images of the Tarot de Marseille. However, I experience the same freedom with both! Consideration of meaning is not constrained by an artist’s specific presentation in either deck. This effect is produced by simplicity in the Tarot de Marseille and image saturation in the Voyager Tarot. I’ll do a proper deck review in the future, but the basic intention behind the Voyager Tarot design was to bring the tarot into the 21st century. Yes, some reconstruction occurs and some purists will wrinkle their noses, but is it largely successful! For example, the suit of Swords was renamed to Crystals. James confessed to a strong aversion to swords being an appropriate symbol for thought. In a sidebar, he wondered if this was some karmic detritus from a past life. He stated that swords are an antiquated and improper symbol conveying warlike confrontation rather than thought. He selected Crystals for the suit of thought as more appropriate and more modern. I get this; that’s thoughtful! I am definitely a fan of the deck and the man! Clients love the beautiful, hypnotic images. Book a reading with me and we’ll use this deck! 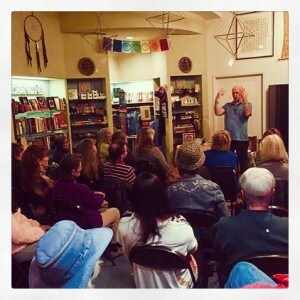 Paradise Found Bookstore – The best spiritual bookstore in town! The Tower and the Star – What Comes After Disaster or Personal Tragedy?